Interplast PE gas pipe systems, produced according to the EN 1555-2 international standard are available in outside diameter sizes ranging from 20 mm to 1000 mm. The small sizes up to Diameter 125mm are available in coils. Larger sizes are available in standard pipe lengths of 6 and 12-meter length or optimized for container transport in lengths of 5,8 and 11,8 meter. We also offer Long Lengths solutions of pipes up to 20M for projects in Ghana and selected West African countries where goods can be transported by road. Interplast PE gas pipe range consists of a wide assortment of pipes available in many diameters and two pressure classes, PN 6 and PN10. Interplast PE gas pipes are suitable for transporting and distribution of natural gas. PE is the preferred choice, particularly in buried low pressure pipe systems like distribution systems. Due to its high ductility, toughness and elasticity, Interplast PE gives no problems during installation at a wide variety of ambient temperatures. The enormous resistance against surge and fatigue eliminates the necessity of a higher pressure rating and investments in anti-surge devices. Additional safety for gas distribution systems. Comparisons have shown that PE pipes have a higher abrasion resistance than other materials; therefore PE pipes are the most preferred for slurry transporting pipe systems. PE is resistant to a great number of chemical agents. In case of doubt, please ask our staff. Because of the good welding ability and elasticity of PE, long lengths can be assembled outside the (narrow) trench. The welded joints are strong and highly reliable and completely tight so no gas can escape. PE pipes offer the installer all possible solutions for installation, which can provide considerable time and cost savings. PE pipes are for example preferred in trenchless and “narrow trenching” installation. The low weight of the Interplast PE system makes it easy to transport and handle. 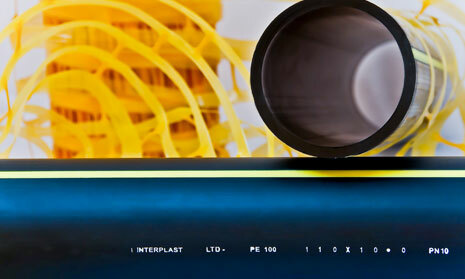 Interplast PE gas pipes comply with EN 1555 – 2 standards. As the transportation of natural gas is dangerous, Interplast gas pipeline installers will have to be certified by Interplast for the installation and welding of PE gas pipes. Interplast offers her clients a complete range of fittings suitable to create a complete system solution.